CANTON, Mass. 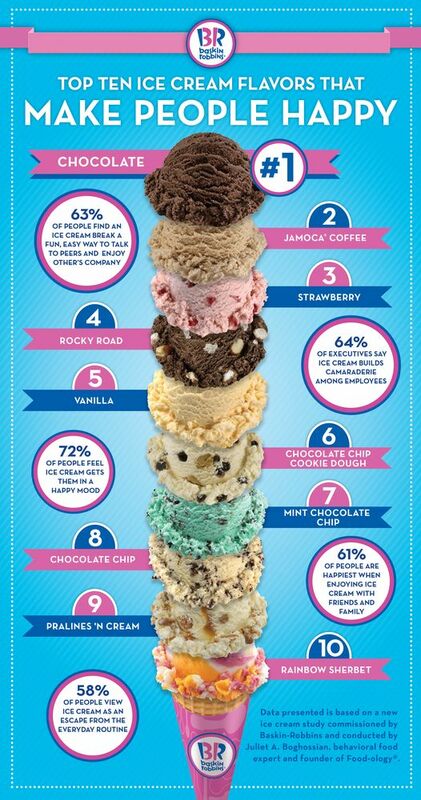 (July 8, 2014) – With National Ice Cream Month in full swing, Baskin-Robbins, the world’s largest chain of ice cream specialty shops, is revealing which ice cream flavors make people the happiest. Baskin-Robbins recently partnered with Juliet A. Boghossian, a behavioral food expert and founder of Food-ology®, an original methodology that links food-related habits to personality traits and behavioral tendencies, on a survey to uncover some interesting insights into how ice cream flavors can enhance or initiate positive outlooks for ice cream fans. According to the survey, the thought of ice cream puts 72% of people in a happy mood even if they are preoccupied, stressed or in a serious mood, while more than 60% of people are happiest, motivated and inspired when enjoying ice cream with family and friends. In addition, 63% of people believe an ice cream break is downtime to be silly, talk and enjoy each other’s company, free of distractions.